or: The best animated film ever made? One word to sum it up: Heart breaking. I may have once been skeptical about the making of Toy Story 3. To be honest, I thought it was just made to be a cash cow and one of those movies which tries to revamp the whole series by being 3D. Being made 10 years after the last one? That was an odd move, too. But after watching the first two the nights before watching this one, I really, really, did not want the series to end. I enjoy the small things in life, and the Toy Story franchise is something which I enjoy much more than a younger kid probably would. Seriously, anyone who doesn't feel some kind of emotion at the end of watching this is a clearly a very cynical person. 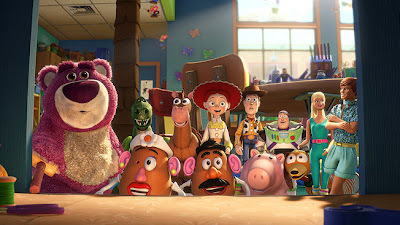 Toy Story 3 is the best (and you know there are a lot of good ones) movie to be made by Disney Pixar, end of story. Andy is now 17 years old, and is off to college to start his new independent life, leaving Woody, Buzz, Jessie and the rest of the gang to ponder their future. When they discover they are moving to Sunnyside Daycare, they are happy that they will be played with again. Unfortunately, they find there are two awful horrors that they experience while living at Sunnyside: the kids aren't as nice or gentle as their former owners and the other toys at Sunnyside are setting out to make life miserable for the gang. The toys must plot an escape plan so they can get out of Sunnyside, which proves to be no easy task. Toy Story was great. Toy Story 2, to me, was still good but lacked the charm that the first one had. However, Toy Story 3 blows them both out of the water. There's always that feeling that a third movie will be the worst of them all, but this one seems to be the extremely rare exception. We are introduced to new characters, and we also have some real villains this time, which helps make the movie more exciting. I mean, Lotso, the strawberry scented bear, and the slightly mishandled baby doll were enough to give me nightmares. I actually got really frightened in some of the scenes in this, but that's what makes this movie so great. 2010 has been a seemingly bad year for movies. However, this, Inception and The Social Network are three movies which have gone down in history for their service to their genres: animated features, sci-fi actioners and biographical dramas respectively. Over the years, we have seen so many great animated features, particularly coming out of the amazing dreamworld that is Pixar. Toy Story 3 definitely tops them all. It has that edge over them: taking something ordinary like a toy and making them extraordinary; amazing computer generated animation that isn't bogged down by the fact it was made in 3D; a hilarious script which both young and old will have a laugh at; but most of all, it has that emotional edge that comes from the fact that we genuinely care about these characters. We've all had a toy which has become our best friend. We all wished so much that they would come to life. Call me a little kid, but I actually felt sorry for the toys I have locked away in my closet after watching this. And the end of this movie made me feel so sorry for them that it just brought out the little kid in me. In the last five minutes of this movie, I couldn't help but bawl my eyes out. There were so many emotions: nostalgia, moving on, happiness, sadness, optimism...but most of all, I hated that it had to end. Any fan of the series will probably feel the same as I did. My recommendation is that you watch the first two reasonably close to watching this one. It's one of the best cinematic experiences I have ever had. 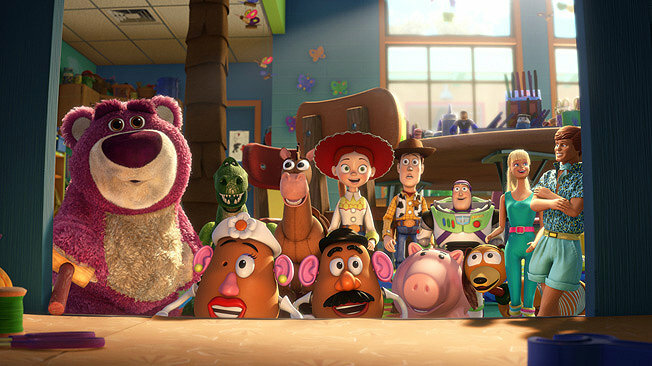 Look at it this way: Toy Story 3 is perfect for any age. It's just an all-round perfect movie. I don't mean to overhype it for you, but there it is. Toy Story 3 will win Best Animated Picture at the Oscars next year, will even get a nomination for Best Picture, and will go down in history as the greatest animated feature ever made. It really is as great as everyone says it is. Woody, Buzz, Jessie, the rest of the gang: I will miss you loads! THE VERDICT: I LOVED this movie. Doesn't matter how old you are, Toy Story 3 is a classic and a must watch for fans of the trilogy.